Today is my 10,000th day. My first day, Friday, January 23, 1987, I was born in Trenton, Missouri, in a hospital that has recently been torn down. I have loved Fridays pretty much ever since. Ten thousand days is a long and wonderful journey, but I am not old. It's in vogue on social media for twenty-somethings to gaze in wonder at college kids born in the Clinton Administration, the girls for some reason wearing the jeans of a 1980s housewife, and conclude that we're #old. But we're not old. People three times our age are old. You cannot be old for 70 percent of your life. As Mark Twain wrote in his autobiography about a time when he was 32: "I wrote the rest of 'The Innocents Abroad' is sixty days… I was very young in those days, exceedingly young, marvelously young, younger than I am now, younger than I shall ever be again, by hundreds of years." But the purpose of this post isn't to be like those graduation advice columns that are really just thinly veiled rants. One of the chief things I've learned is the importance of humility. Even if I'm not old, 10,000 days does give some perspective. There have been plenty of small, routine, comfortable days. For a while, it was tough to imagine days that wouldn't involve going to school in Gilman City. There have been big days, family milestones and incredible trips and epic games I still talk about with friends. There have also been odd, quirky, even bizarre moments, like seeing Rihanna perform an outdoor concert at halftime of the Sun Bowl in El Paso, before she was really famous. Or the time I went on a massive road trip through the American West with two friends, ending up in Salt Lake City watching one of them walk around the Mormon headquarters in shorts in the snow. Or the time I tried to feed a pigeon a blue Skittle in London. He picked it up, held it an instant, and spit it out, leaving tiny beak marks on it. He probably wanted a red one. I've learned to value people and experiences over things when it comes to discretionary spending. I am still learning humility, patience with others, and to avoid comparisons with others. Check back on those. Fortunately, I've learned a lot of things I love. My family and my parents, still married and still farming. Any opportunity to chat with my friends, whether it's over a meal or in front of a TV or anywhere. Autumn. Spring. Summer. Even winter, when the snow is so beautiful. Living in Missouri with its four seasons and taking trips to Colorado. Giving and helping others. Walking into a hot gym on a cold night for a basketball game. The pageantry and camaraderie and fury of a college football Saturday, when Columbia is at her best. The familiar drive to the place I'll keep referring to as "home," probably forever. A game at Kauffman Stadium. Good steak. Pop in glass bottles. Fireworks. The American West. The NCAA Tournament. Harvest. Parks & Recreation. The outdoors. Laughter. Music. Playing golf and tennis and any other sport. Slowpitch softball. Girls, pretty ones. When I'm writing and I can make something sing. That I can make a living writing. On and on and on. And of course, any attempt to commemorate 10,000 days would be incomplete without crediting God, his blessings, and the ancient comfort of Isaiah 41 on days when the way is uphill. I have my share of challenging days, even if the vast majority are things I won't give a second thought to in a year, but overall it's been a great 10,000 days. I've long believed people are meant to chase their dreams, to go for it, to have courage. Do what you love, whether that's traveling all over, appreciating your hometown in ways others don't, or both. Hit send. Go to New York City to see the Great Rivera in Yankee Stadium. Go to London to see the Great Federer at Wimbledon. Live life to the fullest, but live for something more than just your life and your happiness right now. In the last couple of weeks, I've worked in a field on a farm I own with my dad, gone to a baseball game with friends, went to a street concert to be a "come with guy," enjoyed downtown Columbia, played golf in the twilight, marveled at a one-year-old at her first birthday party, and learned about a new service opportunity at church that's going to challenge me and remind me how much I have to learn. A float trip, slowpitch softball season, and a trip to visit home lie ahead. The good old days are right now. Enjoy. On Friday, Dec. 6, I sat with a friend in a saloon in Atlanta, eating the most massive chicken tenders I've yet encountered, in the company of hordes of Mizzou fans, watching about 30 people in Santa Claus suits and one Mrs. Claus streaming inside. We were just off of Peachtree Street, where Margaret Mitchell wrote Gone With the Wind and was later killed crossing the street. When 2013 was ushered in from the delivery room in swaddling clothes, I would not have imagined I would be in Atlanta in the company of so many Santa Clauses on Friday, Dec. 6. But then, the 2013 college football season happened. For me, the first harbinger of the college football season comes in early June, in the form of a thick magazine comically jammed with names and text and statistics, the Phil Steele College Football Preview. I'm still swinging into summer mode then, but it's a reminder of what lies ahead, a first peek at what this year's grand portrait might look like before a brush has been lifted. On a functional level, it's great for familiarizing yourself with what teams have, for casually perusing on those summer nights when it's hot and still and humid outside. On a deeper level, it's the first big look forward at something I'll look back upon for years and years. Still, after Phil Steele arrived on magazine racks, there was summer and its Royals games, float trips and "Blurred Lines." I went on trips to London with my sister, Colorado with my family and Mt. Rushmore with my friends. Eventually, summer wound down, the August perennial crop of new students arrived in Columbia, and college football was back. The season returns on a Thursday night, and ESPN had a doubleheader of games involving SEC teams. The second, Ole Miss at Vanderbilt, was scintillating, a back-and-forth rollicking good time. It was quite a first impression, like when a date opens the door and you're left trying to think of a non-lecherous way to tell her how pretty she looks. My parents and sister came into town to go to the first game of the year with me, against Murray State. My grandma won tickets for them from a by calling into a local newspaper. It was incredibly hot, 100 degrees shortly before kickoff, but football season was back and I was with my family and friends, so life was good. Henry Josey, coming back from a devastating knee injury, ran on his rebuilt knee over the spot where he got hurt and toward the rebuilt rock M hill beyond the north end zone. Memorial Stadium roared with joy and pride as he scored, and the Tigers won big. We were underway. The heat was a theme early in the season, and the second game, an afternoon affair with Toledo, was ridiculous. We tailgated on dutifully. At one September tailgate, I got a call that one of my best friends, Caleb Barron, was moving back to Missouri from Arizona. That was a good day. At the Arkansas State home game, I discovered I could watch the SEC game of the week on CBS on my phone. This was a revolution in pre-game time-spending. Missouri roared through September and nonconference play unbeaten, but the sound and the fury of the SEC schedule would tell the story of the season. Watching on TV, my friends and I saw Missouri overwhelm Vanderbilt. That was the first, "Hey, we might have something here" moment. Then came the following sunny Saturday, when Missouri played at Georgia. Georgia had suffered several huge injuries against Tennessee (thanks, Volunteers, Part I) and suddenly this game, previously written off as a likely loss, was in play. Missouri roared to an early lead. It was hard to process what was happening. But in the second half, Georgia came charging back Between the Hedges and big old Sanford Stadium was rocking while the band kept playing "Glory, Glory to Old Georgia." Then, Missouri quarterback James Franklin got knocked out of the game. There it was, our Missouri luck showing itself again. And yet, somehow, the train didn't come off the rails. Maty Mauk got a huge third down conversion. Then the Legend of Bud Sasser struck. Sasser won a soft spot in my heart by catching an awkward-looking Corbin Berkstresser throw and then needing to fend off Vanderbilt defenders he couldn't outrun with a backwards stiff arm en route to a touchdown in 2012. Against Georgia, he hurled a touchdown pass on a trick play that helped Missouri hang on for the huge win. It was a resounding win. Afterward, Mizzou offensive lineman Max Copeland said he'd been thinking about Gen. William T. Sherman's famous quote, "Make Georgia howl," leading up to the game. Sherman, by the way, is buried in Missouri. The next game, Mauk's first start, was probably what a painting of Mizzou college football would look like. It was a crisp day, but the afternoon sun in a cloudless, brilliantly blue sky still provided some warmth. 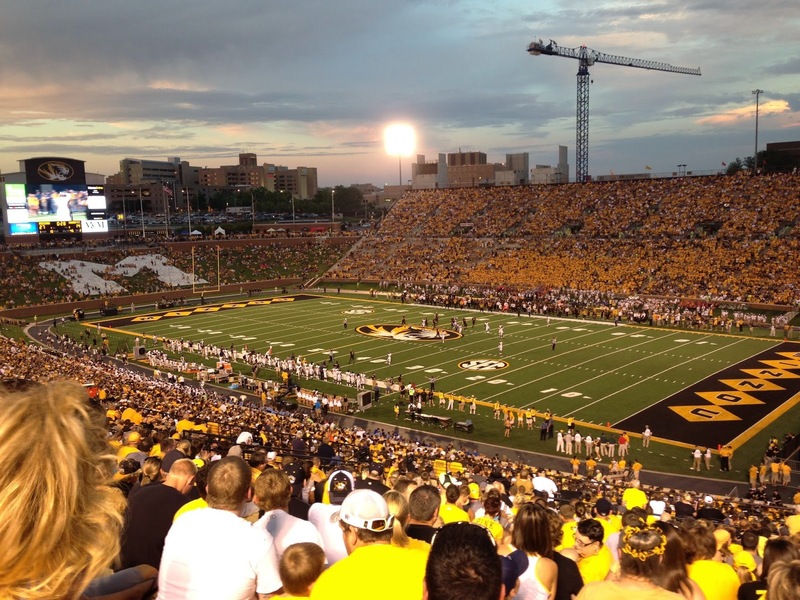 Memorial Stadium was packed for a conference game, and the Tigers hammered Florida. The Gators had a good defense, but their offense was hopeless and not helped by play calling that Woody Hayes would've found overly conservative. Late in the game, fans all over Memorial Stadium broke out into a mock Gator chomp with their arms while "We Will Rock You" screamed from the stadium speakers. Meanwhile, Vanderbilt beat Georgia and Tennessee beat South Carolina in one of the biggest upsets of the year (thanks, Volunteers, Part II). The action was so intense at Tennessee's Neyland Stadium, where a great fan base was starved for a big win, that one Tennessee mom tied her sleeping son to the bench seating so she could fully scream for her Vols as Tennessee drove for the winning score. That, folks, is college football. Suddenly Missouri was in the driver's seat in the SEC East, a wholly shocking development after the shame and struggle of 2012. That set up a huge Homecoming game against No. 20 South Carolina, with plenty of SEC East ramifications. Missouri was No. 5, and fans were a delightful mix of jubilant and nervous. The last time Missouri was in the top five, the Tigers had lost in shocking fashion at home to another ranked opponent, Oklahoma State. MU alum Pat Forde wrote a nice, nostalgic piece about Missouri's unique disasters and setbacks through the years. All schools have heartbreak, Missouri's has just seemed to have a "you've gotta hear this" quality. A fifth down. A kicked ball in the end zone when No. 1 was on the ropes. As mentioned by Forde, a reliable Missouri kicker had a chance to beat Notre Dame in 1984 but missed a 39-yard field goal… short. All schools have painful misses, but rarely does a kicker who has made a 51-yarder in his career miss short from 39. Still, Mizzou fans soaked up the Homecoming, which the university is great at celebrating, with house decs and pep rallies and the parade. Mizzou Homecoming is a feeling and a time and a place. It's magic because that place is always Columbia at its best and that time is you during your college years. Adding to the suspense, a St. Louis Cardinals World Series game raged on at the same time, occupying TVs in the stadium concourse. Missouri took a 17-0 lead into a fateful fourth quarter. Some idiot, who happens to be writing this blog, tweeted "We want Bama!" In the second half, South Carolina put injured starting quarterback Connor Shaw in the game. Shaw is a ridiculous competitor, and his legendary coach, Steve Spurrier, got on a heater calling plays. Suddenly, after a flurry of extremely successful Gamecock screen passes and conservative offense from Missouri, the lead was gone and the game was headed for overtime. Missouri almost won the game in the first overtime, but yielded a Gamecock touchdown on fourth down from the 15. Said blog-writing, look-ahead-tweeting idiot was recording the moment for prosperity on an iPhone, only to inadvertently catch what a stadium going from thunderous to graveyard silent sounds like. On and on the drama continued, until Missouri had a short field goal to force a third overtime. Kicker Andrew Bagget thumped it off the left upright, in the "cursed" north end zone where the kicked ball and Fifth Down occurred. "Oh, no!" the ESPN announced screamed. At a church group pumpkin carving contest the next day, one team entered a pumpkin titled, "The Curse of the North End Zone," depicting a field goal try clanking off the upright. Scary stuff. Still, the Tigers controlled their fate in the SEC East race heading into November, college football's month of destiny. Missouri bounced back with businesslike wins against overmatched Tennessee on Nov. 2 and Kentucky on Nov. 9, ensuring the Tigers would stay in the division race until the end. College football's insanity and intensity were on full display. Nebraska beat Northwestern on a Hail Mary on Nov. 2, and Nov. 9 brought the now-expected great theater of another Alabama-LSU collision. Much crazier things were ahead that month. Missouri was off on Nov. 16. I went home to deer hunt, got a buck on my farm, and that evening watched Georgia and South Carolina's games unfold. There were a lot of scenarios, but a Georgia win at Auburn would likely mean Missouri just needed to win one of its two remaining games to clinch the division. Georgia made a frantic comeback to grab the lead in the fourth quarter. Then, with Auburn facing a fourth and long in the final minute, as I watched with my family in my parents' living room, Auburn's Nick Marshall heaved a pass into the night air. As you know, two Georgia defenders collided and tipped the ball into the air, and an Auburn receiver caught it and streaked into the end zone as the stadium exploded with jubilation. South Carolina beat Florida later that night, meaning Mizzou had to win out. First at Ole Miss, then at home against Texas A&M. For the Ole Miss game, five friends and I loaded into a rented minivan and headed down south for a taste of Dixie. Rolling into Oxford on Friday evening was liking stepping back in time, into a movie set for a southern college football town. Big old houses lined the street as a slow, solemn rendition of "Dixie" involuntarily played in my head. The Square around the courthouse was lit up with softly glowing Christmas lights and people streamed along the sidewalks, in and out of bars, restaurants and stores. It could have been 1969 and the Rebel fans were wondering what magic Archie Manning would perform the next day. Hotty Toddy gosh almighty who the hell are we? Flim flam, bim bam, Ole Miss, by damn!" Gameday brought another meal on the Square, maybe the best chicken parmesan I've ever had, at the Old Venice Pizza Co. Because I've got some child in me and there were crayons on the table, I tried sketching some college football logos on the paper-covered tables. They weren't great, but after we left the table I felt slighted when I saw the staff rolling out a new sheet of paper over my artwork before the next group sat down. After lunch we headed over to the Grove, the school's legendary tailgating scene. Ole Miss fans have a saying that goes something like, "We may not win every game, but we never lose a party." The Grove lived up to its billing, and the Ole Miss girls lived up to their reputation. I ran into one of my old high school classmates, in the Grove in Oxford, Mississippi, of all places. I wandered around with a friend's family is we got an unofficial tour, snapping photos and drinking it all in, the sights, the sounds and the Welcome to the SECs. We ended up hanging out at a tailgate put on by a guy who happened to be the grandson of Fred Bramlage, for whom Kansas State's Bramlage Coliseum. Heavy stuff for a college sports nerd like myself. That was one small reminder of what Missouri left behind in the Big 12. Breaking those 100 year bonds was some kind of upheaval for a tradition and history loving guy like myself. There are still days when I miss the Big 12 terribly. But as I told my friend Nathan Armer that day, while eating Colonel Reb cookies and watching LSU-Texas A&M on a nearby TV, this was not one of those days. One of the cool things about road games is you get to see how other schools organize their gamedays, and Ole Miss' pregame festivities did not disappoint. The students pumped red pom-poms (the SEC does love its pom-poms), Archie Manning walked around on the field, and on the big video screen actor James Franco asked, "Ole Miss fans, are you ready?" prompting a vigorous Hotty Toddy chant. The glittering Rebelettes were hot, and I was enthralled. They linked arms and swayed to the music, awaiting the Rebels' entry. Up shot a giant Ole Miss flag, and out ran the Rebels. Football time in Mississippi. The game was close for a while, but Mizzou played a mature, impressive game, notching the win. There were some wild moments, including a blocked kick seconds after Armer started a thunderous "block that kick" chant, and a fake punt when Harold Brantley rumbled 26 yards down the field. But the game ended without flash, just brilliant execution, as Missouri relied solely on running plays to kill the last eight minutes of the game and lock up the win. The drama shifted back to Columbia, where Mizzou played Johnny Football and Texas A&M, one win away from the SEC East title. Faurot was chilly and packed under the lights, a giant thunderous vessel hurdling toward history or devastation, but into the memory either way. I'd been trying to watch the end of the Iron Bowl before the game, by it's tough to get good phone service when Faurot fills up. I saw Nick Saban pass on a short field goal that maybe would've iced the game to go for a 4th-and-one, which Alabama didn't get. Eventually, my stream of the game was interrupted. But at 6:28 p.m. a series of text messages came through from my friend Chris Coffman. "Auburn just returned a field goal for a td and the win!" "Auburn fans rushed the field." That was how I found out about one of the most memorable plays in college football history. I started telling everyone in our area about Auburn's miracle return and win. After a season that made "We want Bama" famous, Mizzou would play Auburn for the SEC title if the Tigers won the East. That proposition remained in doubt. The game was tight. I got to go onto the field for a group Food Bank check presentation in the first half, snapping a quick selfie with Mike Alden in the end zone as I left the field. I had just intended to take a pic with him in the background, but he sidled up and smiled for the camera(phone). Nice gesture. Johnny Football is an adversary you can admire, a swashbuckling playmaker and competitor. But Mizzou corner E.J. Gaines was shutting down Johnny's best receiver, Mike Evans. The game was tied 21-21 in the fourth quarter. Every breath of chilly air I took, every move I made, it felt cautious, like I was trying to avoid spilling some unseen glass. Triumph and disaster were jousting on a high wire. Finally, mercifully, with less than four minutes to play, Josey burst through a hole in the Aggie line and suddenly found himself running in the open, all the way into the end zone, into history, into the memory of Tiger fans. 28-21 Missouri. The Tigers closed it out, and Missouri was the SEC East champion. SEC fines notwithstanding, fans poured out onto the field like a mighty wave. I was filming the scene with my phone, soaking it in with my eyes. It felt like some great culmination, like Mizzou had struggled so long just to get to this mountain, and now they had climbed it. Fans lingered, delirious with joy. As we finally filed out, "Georgia on my mind" played on the stadium speakers. Perfect. Now it was off to Atlanta as Missouri was playing to win its first football conference title since 1969. I'd taken a long drive to the 2007 Big 12 title game and a short drive to the 2008 Big 12 title game, both losses to Oklahoma and the immovable Bob Stoops. But this time, with a snow storm threatening the roads, my friend Nathan Armer and I flew. Within minutes of landing in Atlanta, I saw an Auburn fan in a "Hey, Nick, got a second?" shirt. Friday night was anticipation and that trip to the Buckhead Saloon. And the MAC title game. On Saturday, we rode on the hotel shuttle to the airport, where we'd get on MARTA for the ride to the Georgia Dome. We rode with some Auburn fans, who said Auburn coach Gus Mahlzan's parents had stayed in the same hotel we did. One of the Auburn fans said she'd bought her ticket through Mizzou, the first indicator we'd be outnumbered. There were also two Alabama fans on the shuttle, and they blew my mind when they said they were rooting for Auburn. Come on, Iron Bowl. But a lot of the longtime SEC fans probably didn't like some Midwestern school making such a big splash in just its second year in the league. I kind of relished the outsider, pseudo-villain role. Bring it on. We arrived at the Georgia Dome with plenty of time to kill. The adjacent Georgia World Congress Center had an SEC Fanfare event, entertainment and the Mizzou Alumni tailgate. Walking around this building was the second indicator how outnumbered we'd be. Auburn is much closer to Georgia, so I expected more of their fans, but it was striking to see so much orange and blue. On an escalator, I counted the ratio of fans we passed going the opposite direction. It was something like 20 Auburn fans to 2 Mizzou fans. But we found plenty of Mizzou fans at the alumni tailgate, where we watched Mizzou basketball beat UCLA on big projector screens, and Mizzou's new bow-tied chancellor made an appearance. The game itself was electric, breathtaking, two programs that had rotten 2012 seasons and then wonderful 2013 campaigns. The winner would maybe play for the national title, if Michigan State beat Ohio State later that night, which ended up happening. Any defensive stop was gold. The first quarter took an hour. So did the second. Dorial Green-Beckham made a touchdown catch that prompted a "How do you do" from CBS announcer Verne Lundquist, his somewhat signature phrase. The lead changed hands rapidly, repeatedly. On and on it went. It didn't happen. Auburn's ridiculous running game won the day, gashing Mizzou again and again, seemingly every time Mizzou needed a big stop. 59-42. In the immediate aftermath, as confetti and streamers rained down on the Georgia Dome turf, I thought, if they didn't win a the conference title this year, when they got some breaks and everything seemed to work out, when will they? The disappointment lingered, for sure, but this was still a remarkable season. And as big of a fan as I am, it's tough to be too disappointed when you're having the time of your life. The Monday after the SEC Championship Game, I attended a Food Bank luncheon at the Stoney Creek Inn with coach Gary Pinkel as one of the featured speakers. I wanted to get an autographed football for a person whom I had invited but wasn't able to attend. Pinkel slipped out right after the luncheon, but I caught up to him in the parking lot near his black SUV. He was gracious and cordial as he signed the ball, and had me spell the fairly basic name he was making it out to. He was wearing one of those rubber wristbands, but I could only read one word on it. Mizzou put an exclamation mark on the season with a win in the Cotton Bowl over Oklahoma State, in Jerry Jones' Dallas football palace. It was in so many ways like the famous 2007 season, when Missouri also went 12-2 with one regular season loss, a loss in the conference title game when a win would've meant a berth in the national title game, and a win in the Cotton Bowl and top-five final ranking to cap it off. I watched the national title game from the same seat when I watched college football's opening night. Florida State ended the SEC's national title streak, and the final touchdown of the season was caught by a player with the last name Benjamin. All college football seasons are thrilling and memorable, but 2013 was extra special, so here's to it. I really do try to enjoy each day and moment, year round, but I'll also tell you that I'm already excited for college football 2014. There's a lot of wonder and fun in store this spring and summer, but I know this: come Aug. 28, an old friend and I will be reunited, the kind of friend you get to share with your family and friends. That, folks, is what makes it so special. Missouri’s season came to a close on Sunday afternoon at Mizzou Arena, when the Tigers lost 71-63 to Southern Mississippi in the second round of the National Invitation Tournament. Southern Miss (29-6) had the highest Ratings Percentage Index (RPI) ranking of all teams that didn’t get in the NCAA Tournament, and they looked like the better team on Sunday. The Golden Eagles built a lead in the first half, and then held off the Tigers each time Missouri made a run. Southern Miss is not a particularly huge team, but they controlled the game inside and won the rebounding battle. Missouri did make seven of its 14 three-point attempts in the game. In his final game as a Missouri Tiger, Earnest Ross scored 22 points on 6-of-9 shooting. The Tigers were able to rally from a double-digit deficit in their first NIT game, against Davidson, but could not repeat that against Southern Miss. It was Missouri’s first home loss to a non-conference opponent since falling to Sam Houston State in the first game of the 2005-06 season, known to those of us who were there as the Ryan Bright game. Missouri ended the season with a 23-12 record. It was a disappointing season, as is usually the case when Missouri misses the NCAA Tournament. The Tigers could have made this year’s Big Dance with just a few more wins against lesser opponents. Missouri finished in a three-way tie for sixth in what we’ll call a fairly pedestrian Southeastern Conference. The Tigers had two players with pro potential, and they still could not make it into the NCAA Tournament. That leads us to the key questions for the team heading into next year. Jordan Clarkson and Jabari Brown both could have the opportunity to leave a year early to test the waters of the NBA Draft. Neither one projects to be selected very high right now, so that could bode well for them coming back. However, players have been known to leave on just the faintest whisper of NBA potential, so we’ll have to wait and see. Beyond those decisions, Missouri will need to work to develop more of an inside presence. Freshmen Johnathan Williams III and Torren Jones showed flashes of potential this season, in Jones’ case later in the season after he got more experience. Their development will be key for the program going forward. So far, coach Frank Haith has relied heavily on transfers, and next season transfers Cameron Biedscheid, from Notre Dame, and Deuce Bello, from Baylor, will be eligible to play. It will be interesting to see how the new faces contribute and fit in with the current players. Next season will be a big year for the program, as the Tigers try to get back in the NCAA Tournament and reverse two seasons of decline after a great first year for Haith. Tiger fans are probably ready to put this season behind them and hope for better things next year. Missouri’s NCAA Tournament hopes were dashed for good in Atlanta last Friday, when the Tigers fell 72-49 to Florida in the SEC Tournament quarterfinals. Missouri (22-11) hung tough with the No. 1 Gators for about 30 minutes, but Florida pulled away in the final 10 minutes. The game came the day after Missouri’s double overtime win against Texas A&M. Missouri’s loss to Florida was a nice effort, but also a reminder that Florida, which went 21-0 against SEC teams this season, is one of the nation’s most complete teams. For the first time since 2008, Missouri’s name wasn’t called on the NCAA Tournament’s Selection Sunday. It broke a string of five straight NCAA Tournament appearances by the Tigers, which tied for the longest streak in school history. Missouri has made the tournament 26 times altogether, but appearance number 27 will have to wait until at least next year. Missouri was selected to play in the second-tier National Invitational Tournament. The NIT does have a lot of history, if not very much prestige these days. Heading into this year’s edition, Missouri is just 1-7 in the NIT, although as a 2 seed the Tigers have a decent chance to make a run in the tournament. The teams in Missouri’s quarter of the bracket are certainly manageable, as one would expect in the NIT. But an inability to take care of manageable opponents is why Missouri is in the NIT. Still, beating Davidson, Southern Miss or Toledo and then one of Minnesota, High Point, St. Mary’s or Utah is all it would take to get to the NIT’s final four, at world-famous Madison Square Garden in New York City. But the NIT is less about matchups and more about simply seeing the Tigers play good basketball. Play hard, play reasonably smart, win a few games and give some positive final note to what has been at times a frustrating season. Making a run in the NIT isn’t cause for throwing a parade, but it beats playing poorly in the NIT. Should the Tigers make a run to the NIT’s final four, playing at storied old Madison Square Garden would be a great experience for them and some nice exposure for the program. And hey, as challenging as this season was, the NIT brings another chance or two to see the Tigers in action at Mizzou Arena, and a fairly cheap chance at that. Regardless of what happens in the NIT, the story of this season has been written, of course. Even if they won’t make it every year, the Tigers’ goal going into each season should be to get into the NCAA Tournament, and they had a few too many bad losses to make that happen this year. Next year will be a big year for Missouri, trying to get back into the NCAA Tournament and avoid getting too much negative momentum for the program. The NIT may not be much consolation, but it’s a chance to get a leg up on building some positive momentum. Missouri got off to a rough start in conference play, losing in overtime to Georgia last week before clinging on for a 70-68 win at Auburn. Neither of those opponents are especially good, but the Georgia loss at Mizzou Arena was particularly damaging, putting the Tigers a step back as soon as SEC play started and ending what had been the nation’s longest home winning streak. Georgia was ranked outside the top 200 in the Ratings Percentage Index, which is one of the criteria used by the selection committee for the NCAA Tournament. Coach Frank Haith said his team was “too cool” after that loss. Even though several SEC games will be against teams who aren’t very good teams, Missouri can’t afford to coast, even against the Georgias of the world. As Missouri (13-2, 1-1 in SEC play) wade deeper into its 18-game conference schedule, we still don’t know how good the Tigers are. The Tigers have some good pieces; Jordan Clarkson can take over a game, Jabari Brown can be a very good shooter, Earnest Ross and Johnathan Williams III are athletes who can contribute in a lot of ways. But the Tigers seem to lose their edge sometimes against lesser opponents. We don’t know Missouri is a bad team, but the Tigers haven’t show much against quality competition yet. There are some tougher games ahead, although plenty of winnable ones remain in a fairly down SEC. After a road game at Vanderbilt Thursday night (6 p.m. on ESPN2), Missouri hosts Alabama at Mizzou Arena on Saturday (1 p.m. on ESPN). Alabama (7-8, 1-1 in SEC play through Sunday) opened SEC play with a five-point win over Vanderbilt before losing 66-58 at Georgia last Saturday. The Crimson Tide are led by senior guard Trevor Releford, who is scoring 18.2 points per game while dishing out 2.8 assists per game. Releford, from Kansas City, scored 26 points in the Tide’s loss at Mizzou Arena last season. On paper, Missouri should win this game. Even with the Georgia loss, Missouri is 41-2 at Mizzou Arena under Haith. That loss was an early handicap, but Missouri can still win its first regular season conference title since 1994, provided it doesn’t have more stumbles against inferior teams. Kentucky and Florida are the teams to beat in the SEC this season, and Missouri only plays them one each. Those games come in a tough four-game stretch starting later this month. From Jan. 28 through Feb. 8, Missouri plays at Arkansas, home against Kentucky, at Florida and at Mississippi. Winning even two of those four games would be big for the Tigers. But Missouri has a few more games to get to playing better basketball before that tough stretch, including Saturday’s home game with Alabama. The Tide can be scrappy, keeping it close in games with Duke and unbeaten Wichita State earlier this season. But Missouri needs to win this type of game if it’s going to hang in the SEC race and make the NCAA Tournament. The fourth quarter of the Cotton Bowl provided a thrilling finale to Missouri’s thrilling season. With a field goal early in the quarter, No. 13 Oklahoma State (10-3) had erased the Tigers’ 17-7 halftime lead. No. 8 Missouri (12-2) answered with a touchdown, which Oklahoma State promptly matched. Andrew Baggett followed with a clutch 46-yard field goal to put Missouri back on top, but then the Cowboys took a 31-27 lead, their first of the game, just 85 seconds later. What had been a game largely controlled by the defenses for three quarters became a shootout. Missouri raced down the field, and Henry Josey broke free for a 16-yard touchdown run to put the Tigers back on top with 3:08 left in the game. Missouri needed one more big play from its defense. Did they ever get it. As Oklahoma State drove into field goal range, senior Michael Sam, an all-American defensive end, knocked the ball away from Cowboy quarterback Clint Chelf. Shane Ray ran it back 73 yards for a touchdown with 55 seconds left to seal the 41-31 win for the Tigers. The Tiger sideline erupted, as did fans in attendance and those watching on TV across the chilly Show-Me State. Another senior, quarterback James Franklin, struggled to get the offense going for much of his last game as a Tiger. But coach Gary Pinkel stuck with him, exuding the loyalty bordering on stubbornness that he has shown throughout his 13 seasons at Missouri. It’s largely worked for Pinkel, who became Missouri football’s winningest coach with the Cotton Bowl win, and it worked in that eventful fourth quarter as Franklin got in a rhythm and directed three scoring drives down the stretch. The backup quarterback, Maty Mauk, was impressive in his cameos, getting to lead one drive in each half, tossing a touchdown pass on his first-half drive. It was a glimpse of the future and a 2014 season that could hold a lot of promise for the Tigers. Missouri loses Sam and Kony Ealy, who declared for the NFL draft, along the defensive line, and will have other key players to replace. But the SEC East has a lot of teams rebuilding or replacing huge contributors, and Missouri’s two West opponents, Arkansas and post-Johnny Manziel Texas A&M, look manageable. But first, a word for this freshly minted 2013 season. The Tigers showed they could compete in the SEC, and in hindsight that seems obvious they could do so. After all, Missouri faced some great programs through the decades in the Big Eight and Big 12. This program has a lot going for it. I don’t know if Pinkel will ever get that brass ring of a conference title, but he has done a lot of good things with Missouri, now highlighted by two 12-2 season and Cotton Bowl wins, 2013 joining 2007 in the memories of Tiger fans. Above all, it was a fun season, a needed dose of big games, memorable plays and joy after the struggle of 2012. There’s plenty to savor about Missouri’s just-completed season, and plenty to get excited about for 2014. Below are a few columns I didn't get posted the week I wrote them for the newspapers. I make it a New Year's resolution to get them posted each week this year. Some bowl matchups can be less than appealing. Fans surely appreciate one more chance to see their team play, but with a bloated schedule of bowls, sometimes the games are matchups of mediocre teams playing before half-empty stadiums, often rusty after three or four weeks off and sometimes working with an interim head coach. Fortunately for Missouri, that’s not the case for the Tigers this year. No. 8 Missouri (11-2) has a gem of a bowl game, against No. 13 Oklahoma State (10-2) in the Cotton Bowl. The teams have a long history, plenty of talent will be on the field, and the Dallas Cowboys’ AT&T Stadium will have a big crowd for the 78th Cotton Bowl (7 p.m. Friday on FOX). Missouri’s last big bowl game was the 2008 Cotton Bowl, after the memorable 2007 season. It’s another trip to Dallas, but a lot has changed since that season. Missouri has, of course, since moved to the SEC. The Tigers wear different uniforms. The game itself has changed venues, from the old Cotton Bowl stadium on the Texas State Fairgrounds to the Cowboys’ massive stadium, nicknamed “Jerry World” in honor of owner Jerry Jones, who spared no expense in building the football palace. As a fringe benefit, the only bowl game FOX airs is the Cotton Bowl, so FOX has been airing ads for the game featuring Mizzou to its NFL audiences for weeks. With 11 wins and an appearance in the SEC title game, this season will be remembered as a success regardless of what happens in Dallas. Still, this is a big game for the Tigers. Losing back-to-back big games to end this season could stunt some of the momentum Missouri had built up. Pinkel is 4-4 in bowl games, and Missouri is 13-16 all-time in bowl games. Missouri’s 30th bowl game is against an opponent they know well. Missouri and Oklahoma State have played 51 times (Missouri leads the all-time series 28-23), and the two were in the Big Eight and Big 12 together for decades. On paper, these teams are pretty even. The Cowboys score 39.8 points per game; Missouri is a 39.0. Oklahoma State’s defense holds opponents to an average of 20.0 points per game; Missouri’s defense is at 22.5. Missouri has more balance on offense, with 256.5 passing yards per game to 236.5 yards rushing. Oklahoma State is a little more passing-based, piloted by senior quarterback Clint Chelf. The ability of Missouri’s defensive line to get pressure on Chelf will be a key subplot in the game. This should be a close one, and a fitting end to the season for these two teams. Last Saturday was another thrilling Braggin’ Rights game in St. Louis, with 15 lead changes and six ties before a big crowd split just about half and half between Illini and Tiger fans. This time, Illinois (10-2) pulled out a 65-64 win, ending a run of four straight Missouri victories in the series and taking a 21-12 lead in the all-time Braggin’ Rights series. Late in the game, Missouri coach Frank Haith drew up a nice play, working his team’s strengths, with Jordan Clarkson driving into the lane and then, after the defense collapsed on him, kicked it out to an open Jabari Brown, who buried a three to put the Tigers (10-1) ahead. However, two Tracy Abrams free throws with 4.6 seconds left, after Illinois twice almost lost the ball on its final possession, put the Illini ahead for good. Clarkson, a junior transfer, has shown to be Missouri’s best player this season, and he was outstanding against Illinois, with 25 points on 8-of-13 shooting, eight assists and six rebounds. To succeed this season, Missouri probably needs all of its “Big Three” offensive players to contribute, with Brown and Earnest Ross supporting Clarkson. Against Illinois, Brown had an off shooting night and Ross took some ill-advised threes. Missouri’s 14 turnovers were also a key factor in the loss. Still, a one-point loss to a solid opponent in a rivalry game that could’ve gone either way is no reason for doom and gloom. It was just a missed chance for a quality win, and chances for those will be fairly rare during SEC play, as the conference appears to be having another malaise of a hoops season. One thing to keep an eye on, however, is Missouri’s fairly thin rotation. The Tigers used only seven players against Illinois, and Missouri got only eight points, two rebounds and no assists from its bench. Again, no cause for alarm yet, but something to watch this season. Missouri has another chance for a decent win in its first road game on Saturday at North Carolina State (7 p.m. on ESPN2). North Carolina State (9-2) suffered early-season losses to Cincinnati and North Carolina Central, but have won seven straight, including a win at Tennessee on Dec. 18. Sophomore forward T.J. Warren will provide a good test for the Tigers inside, averaging 23.9 points and 7.3 rebounds per game. Also keep an eye on BeeJay Anya, who provided energy off the bench in the Wolfpack’s wins over East Carolina and Tennessee, blocking five shots in each game. Road games were a problem for Missouri last year, even against lesser opponents. The Tigers went 2-8 in true road games last year. Life on the road is tough in college basketball, but teams that get good seeds in the NCAA Tournament find ways to win their share of road games. Saturday will be our first chance to see if this year’s team might be different. In beating Western Michigan 66-60 on Sunday night, the No. 24 Missouri Tigers improved to 10-0 on the season and also extended the nation’s longest home winning streak to 25 games. It was a sometimes ragged game before a not quite half-full Mizzou Arena, but the Tigers made some big plays each time Western Michigan (5-4) got close. Missouri held the Broncos to just 30 percent shooting. But even if it wasn’t a pretty win, it added to the Tigers’ growing momentum early in the season. Heading into the season, most analysts thought Missouri was on the bubble for making the NCAA Tournament, and that they would have to scramble to earn a sixth straight berth in the Big Dance. That may end up being the case, but the early returns have been encouraging. Missouri has beaten mostly weaker opponents, with the notable exception of the home win over then-No. 18 UCLA on Dec. 7, a win that should bolster Missouri’s tournament resume all season long. Transfer guard Jordan Clarkson has been as good or even better than my high expectations, averaging 20.2 points per game on 51.5 percent shooting so far. Freshman Johnathan Williams III, who as a 6-foot-9 forward out of Memphis may remind Tiger fans of Laurence Bowers, is leading the team in rebounding at 8.6 per game. On Saturday, the Tigers face Illinois (9-2) in the annual “Braggin’ Rights” game in St. Louis (4:30 p.m. on ESPN2). It’s something of a rivalry game. I say something because when Illinois plays its other basketball games, a lot of Missouri fans either don’t care or root for the Illini to help Missouri’s strength of schedule. That was, well, not quite the case with Kansas. Still isn’t. But I do enjoy this game, usually nestled right before Christmas. There is still an element of rivalry there with the proximity and playing every year. It’s also a great atmosphere, with the half-and-half crowd taking turns exploding as the Tigers and Illini race up and down the court. It’s also a good game oasis in what’s often a sea of scheduled blowouts this time of year. It’s a good indicator for both teams of what they have and how good they are. Illinois has played a fairly soft schedule so far, but it’s getting tougher in a hurry. The Illini lost 71-64 at No. 15 Oregon, certainly a respectable result. Rayvonte Rice leads Illinois in scoring with 17.7 points per game. Senior Jon Ekey, from Independence, Mo., leads Illinois in rebounding. The Illini are probably an NCAA Tournament bubble team. This is a big game for them, as it is for the Tigers. Illinois leads the all-time Braggin’ Rights series 20-12, but Missouri has won the last four meetings. In the last three, both teams were ranked. Neither teams have played a ton of quality teams yet, so it’s hard to know what will happen. But based on what we’ve seen so far, I think the Tigers should make it five straight over the Illini.